We develop and constantly improve our computer rheography devices with patient accurate diagnostics and doctor convenience in mind. That is why we can provide you with the most rational offer and guarantee a solid partnership. Why did dozens of clinics go for RHEOTEST? When working at RHEOTEST we took into account doctors’ demands and paid close attention to the device being user-friendly. For that reason, RHEOTEST is designed with the minimum set of operation elements and maximum simplicity in handling. The interface is easy to understand from mode slection to building the assessment report. 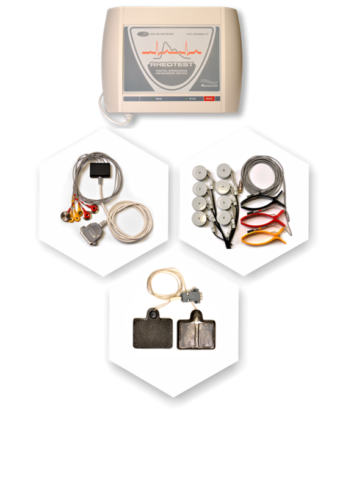 RHEOTEST set contents depends on client needs. Where would you like to pace your device – on the wall or on a rack? Would you like to use a PC or a laptop? Which appliances do you prefer when registering a reogram? What cable length would you like to order? Our consultant will help you place your order right. If you order your device on a mobile rack, you receive a mobile rheography device to serve your professional needs in different locations. Select the modification you need depending on the level and specifics of tasks your medical establishment is facing. Central hemodynamics, Rheoencephalography, Rheovasography, Rheogepathography, Rheopulmonography, Rheorhenography and Rheocardiography. 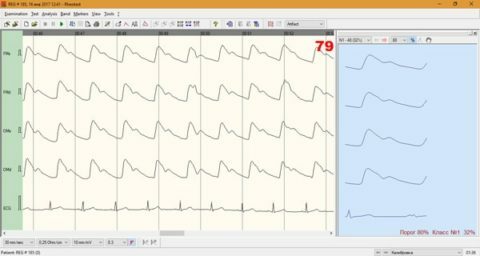 Seeking advice or having a query as to rheography devices? Do not hesitate to contact us! 1 Advise is free and does not bind you to anything. 2 You deal with highly-qualified staff: when your tasks are clear, our consultants make you decide on device type and modification. 3 Leave your contact number in the contact form and we will get back to you. 4 If you prefer text messages, contact us via Skype: dxsystems, or e-mail dxmeddevice@gmail.com or leave your phone number in the contact form and we will get back to you .. The device makes it possible to conduct a variety of research: rheoencephalography, rheovasography, rheogepathography, rheopulmonography and rheocardiography (by Kubichek and Tishchenko). During rheogram registration it is possible to relocate main tools and extras in the panes. The user can customise band speed, rheogram and electrocardiogram amplification, curve background and main color and print out band fragments and individual complexes on graph paper. A protocol containing any number of functional tests is a handy fucntion envisaged for even more convenience when running an examination. 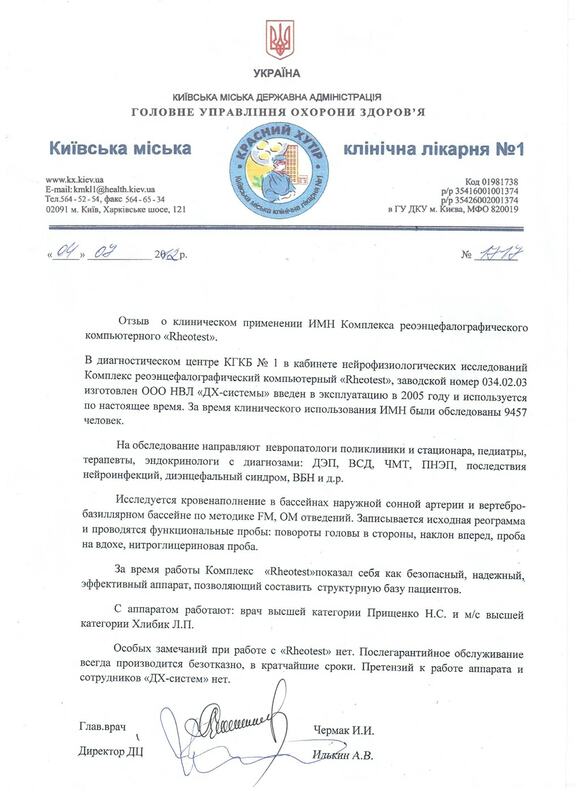 Preliminary analysis of one of the registered complexes is possible already during signal registration. A random complex may be selected to be compared with another complex, which may be part of a different functional test. Likewise, an analagous test taken from an examination of, say, a month before may be analysed. 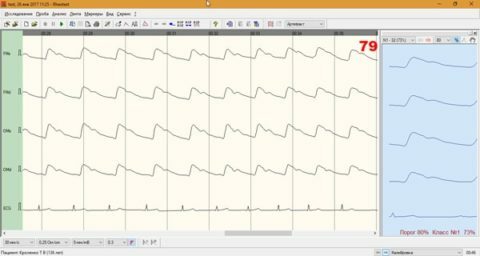 The Rhythmogram Window makes it easy to immediately spot the areas on the band that require consideration. 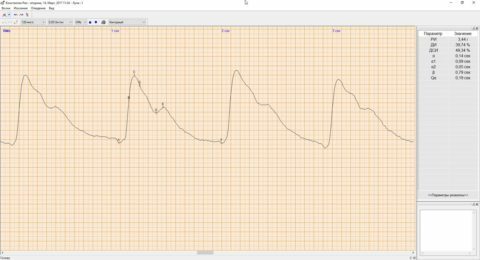 It takes one click to position a marker on the curve to capture certain heart rate. It is possible to color mark the current position and the sections not suitable for analysis and marked as artefacts. 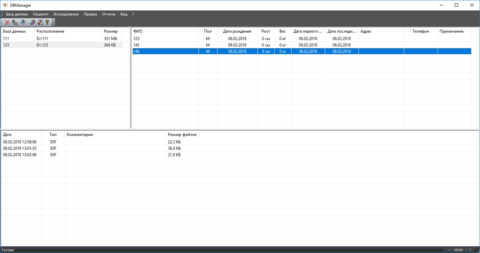 During the review it is possible to customize lead view, for example, by changing the order in which the leads are displayed or disabled. When analysing a rheogram it is possible to select a set of characteristics with regard to the examined basin. 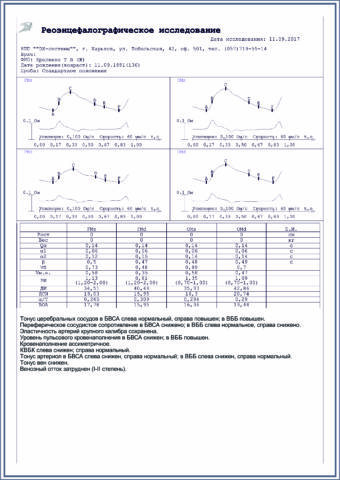 The software automatically identifies and classifies rheocomplexes by placing markers (marker placement is to be corrected manually) and calculates amplitude and time parameters. The Magnifier Window displays the following elements: the rheowave, the differential curve, rheographic indexes and time characteristics of the rheo signal. The Complex Window displays the rheocomplex channelswise and the summary table of amplitude and time parameters. You may set the way the rheogram is displayed: each channel separately, pairwise from one basin or one-sided. The programme assesses rheogram character and time history both during a regular examination and during functional tests registration. Heart rate variability analysis is one of RHEOTEST key functions. 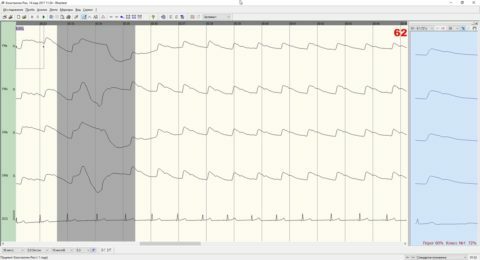 Such analysis looks into time history, heart rhythm wave structure, scattegram and Bayevsky’s variational pulsometry. The doctor decides as to medical assessment report contents and layout. It may be a rheocomplex with amplitude and time characteristics and autodescription, generated in accordance with the selected method and with due regard to age appropriate normal values or a rheographic curve of the selected length and a differential rheogram. The user builds a database using patient data stored on the computer and the registered rheograms. 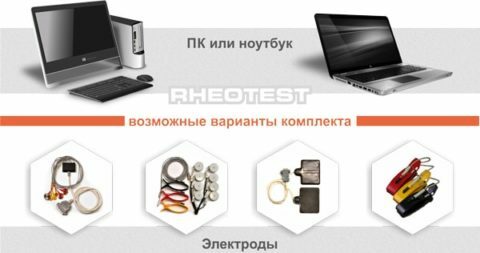 RHEOTEST developers considered the process with particular attention. The database comes with a full set of functions the user needs to handle patient electronic card-index and voluminous information archives. The quickest possible way to see how well RHEOTEST suits you is to try using the software. Rather often one of the reservations in buying a reography device is a fear of handling a complex software. We can assure you, any functionalist doctor can handle our rheography software. Download RHEOTEST demo and see for yourself how user-friendly it is. 1. We call you back, get back to you on Skype or via e-mail, help you via TeamViewer and come to your location. 2. We provide you with quality spare parts on time. 3. We deal with maintenance and calibration tests. 4. We provide you with software updates free of charge. 1. We either effectively handle your issues at a distance (by telephone or Internet) or visit you onsite. 2. In case the device needs to be taken out for repairs, we substitute it with another one, to avoid ruining your work day. As a token of our appreciation to the owners of RHEOTEST rheography devices we are offering a considerable personal discount on the next generation reography device. The same offer is envisaged for new customers after they have purchased our rheograph. 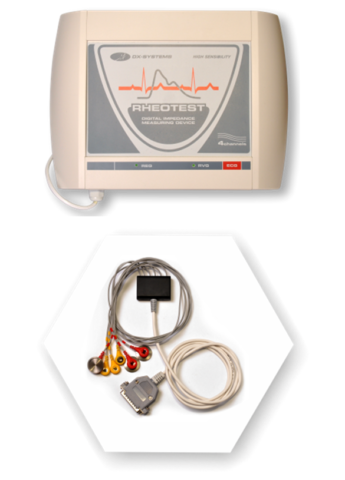 15 Day Free RHEOTEST Trial. 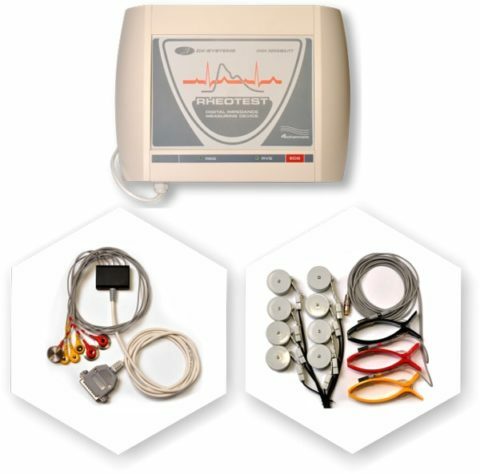 How do you know RHEOTEST is what you need and if it is worth its money? Try it for free to find out! We bring it to your site, install it, set it up and show you how to use it. From then on you have 15 days to see if it suits you. 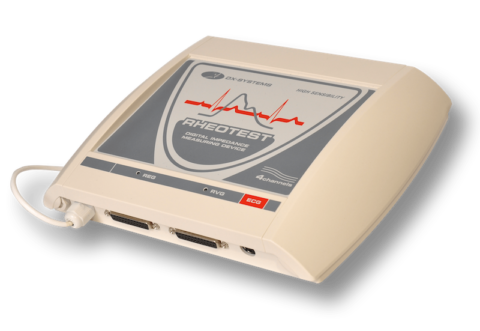 To buy or not to buy RHEOTEST? The choice is yours. Why do we offer you the free trial? We are eager to get as much feedback as possible for device further improvement. 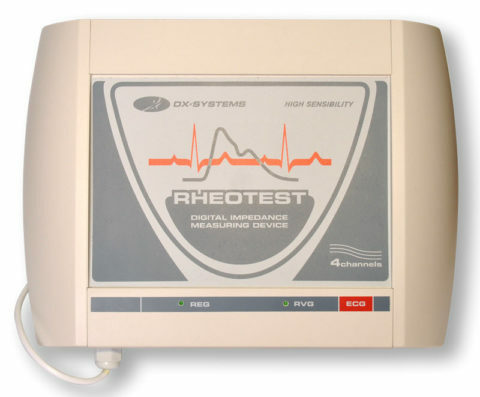 5If you decide on purchasing RHEOTEST, we will ensure you with a new device. If you decide against the purchase, we will be happy to hear your feedback as to 15 days of operating RHEOTEST, how it was and what you lacked. You leave your digits and we call you back. It ususally hapens within an hour. The consultant will discuss delivery details and confirm your order. 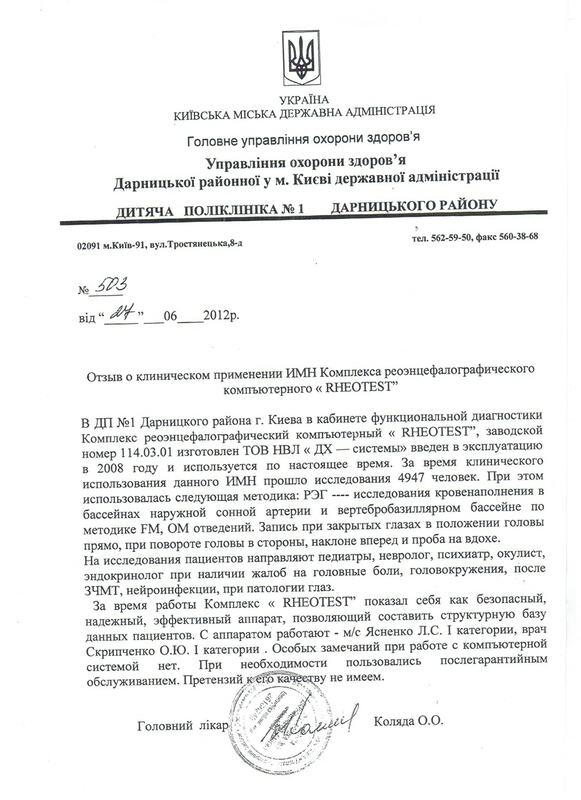 Feedback as to clinical use of RHEOTEST Computer Complex (production number 034.02.03) in Kyiv Municipal Clinic No1. RHEOTEST rheoencephalography device, produced by NVP DX-Systems, was placed into service in 2005 and has been used in our diagnostic centre since then. 9457 people have been examined over the period of use. The patients with cerebral palsy, vasomotor dyscrasia, traumatic head injury, pseudo-epileptic seizures, neurological infections sequelae, diencephalic syndrome, vertebrobasilar disease and other have been referred to the diagnostic centre for examination by the doctors of the polyclinic and the in-patient hospital. Blood filling in external carotid basins and vertebrobasilar basins is examined in accordance with FM, OM leads method. 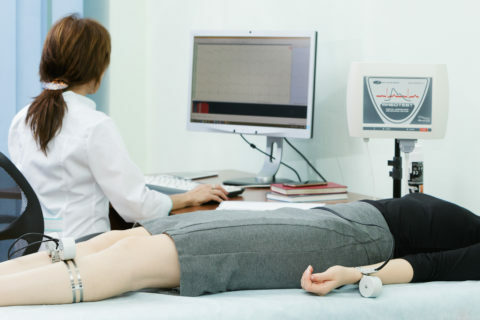 We record a reference rheogram and carry out functional tests: side-to-side head rotation, lean forward, intake of breath and nitroglycerin test. Over the time of use RHEOTEST prooved to be a safe, reliable and effective device, which enables us to create a patient structural database. We have had no major issues while operating RHEOTEST. Postwarranty support has always been ensured and in the shortest time possible. We have no complains either to the work of the apparatus or the staff of DX-Systems. RHEOTEST computer rheoencephalography device, produced by NVP DX-Systems was installed in the functional diagnostics room in 2008 and has been used since then. 4947 peope have been examined over the period of RHEOTEST use. Blood filling in external carotid basins and vertebrobasilar basins has been examined in accordance with FM, OM leads method. Tests were recorded with patient eyes shut and head right, head turned side to side, lean forward and breath intake. Patients have been directed for RhEG examination by pediatricians, a neurologist, a psychiatrist, an ophthalmologist and an endocrinologist. Indications for an examination have been a headache, dizziness, closed craniocerebral injury, a neuroinfection and an eye pathology. RHEOTEST has proved to be a safe, reliable, effective complex, which makes it possible to create a patient structural database. Advanced nurse Yasnenko and Skripchenko – first category doctor – have been operating the device. We have had no major issues with the device. We resorted to post warranty support, when needed, and have no complains as to its quality. 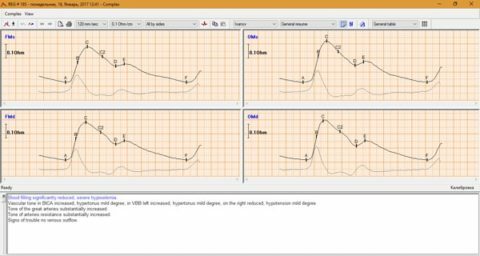 Feedback as to computer rheohraphy system produced by NVP DX-Systems. Over 7000 patients with different locomotor pathologies and undergoing treatment or needing prosthetic repair in the clinic of the Institute have been examined. The Complex has been used to address a broad range of tasks in terms of vascular pool examining. The system is easy to master and operate, equipped with handy software and is rather responsive . Examination data has been represented on quite a good level. 1Leave your phone number and we will get back to you to give you product details, tell you how it works and explain purchase conditions. AsapIn an hourTomorrow - When do we call you back?